With over 7000 islands to choose from I was always gonna have my work cut out in the Philippines! But I had a good idea of where I wanted to go so I planned my itinery before I left England. My only slight concern was that I was travelling to the Philippines in the rainy season (aka typhoon season) so my plans may get interupted! My journey started from Kota Kinabalu, Malaysia with a 2 a.m flight to Manilla where I spent 4 hours before connecting to my first island ... Palawan. After getting off the plane in Puerto Princesa I jumped straight into a mini van and headed 6 hours north to El Nido. Now I'd heard great things about this place and I wasn't to be disapointed! I found a place to stay called 'The Alternative' right on the beach less than 5 metres to the waters edge. The bay was surrounded by steep jagged limestone cliffs covered in green tree's that dropped into the sea. I arrived in the evening and was exhausted but I still dragged myself out to watch some live music at the Art Cafe bar and enjoy some of the local beer, san miguel pilsen. I got talking to the barman who was very accomodating. He sorted my out a couple of free beers on the house and gave me some great info on El Nido. 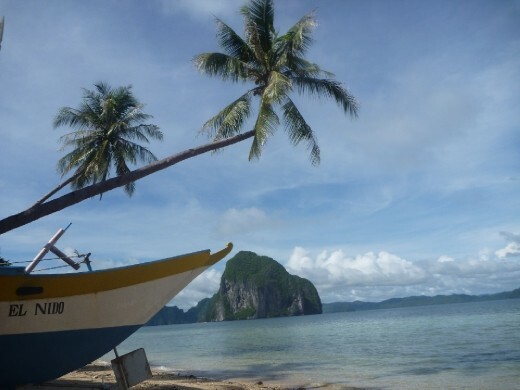 On my first day I walked to Las Cabanas beach, recognised as one El Nido's best beaches. I arrived early and had the place to myself. A lovely stretch of beach outlined with palm tree's and a connecting sand bar to a smaller island. I went snorkelling and saw some great stuff, the usual nemo's, a cuttlefish, boxer shrimp, and a few other fish that I couldnt ID! Later on I noticed a turtle surfacing for air a couple of times too. The weather was great and the views of the islands in the distance were beautful. The next couple of days I booked on 2 island hopping/ snorkelling trips around the barcuit archipelago. Now this place was paradise! Each trip consisted of 5-6 different locations to stop, swim, snorkel, etc with fish/ chicken BBQ lunch included at midday. The different stops were beautiful blue lagoons and secret white beaches. Many of them were so remote that you couldnt see them before you were actually on top of them them as they were concealed in between jagged limstone cliffs. Some only accessible by climbing though narrow gaps in the rock! The scenery was just amazing! I enjoyed some great snorkelling seeing octopus, a turtle, a sea snake, a snow flaked eel, a mantis shrimp and loads of other different stuff in the crystal clear water, the visibility was superb. Now I know the movie 'The Beach' was filmed on Ko Phi Phi in Thailand, but rumour has it that the original book that the movie was based on, written by Alex Garland, was inspired by El Nido - and I could see why. I spent 3 nights in El Nido before taking an overnight bus back to Puerto Princesa with one eye on my flight to Cebu on the 17th. In Puerto Princesa I visited the subterraneon underground river which runs 8.2km underground through cave's before spilling out in the south china sea. It's recently been added to the new 7 wonders of nature. The cave itself was swarming with bats and full of different rock formations of all shapes and sizes, our boat only went 1.5kms inside as you need a special permit to go further. After the river trip I headed back for a night in Puerto Princesa before my flight to Cebu the next day. What a start to the philippines!